A key part of writing for television is watching television. And learning from it. Screenwriting lessons from tackles series past and present, analyzing them through the prism of screenwriting. I’ve been on a sci-fi binge recently, so I decided to rewatch one of the greatest (and perhaps underrated) science-fiction series of all time: Rockne S. O’Bannon’s awesome Farscape. It’s fun, it’s dark, it’s light, it’s amazing. Both serialized and stand-alone, the show has revolutionized, in more ways than one, the genre it was set in. Almost ten years have past since it ended, but the legacy lives on. Perhaps one of the most controversial lessons to take away from Farscape is this one. The first season’s first half is considered by many to be the worst. As always, the writers were still figuring out the characters, so it makes sense. Until perhaps its third season, Farscape wasn’t overtly serialized, but it still kept small amounts of mythology spread throughout. In other words, it was always giving viewers information (big or small), even during seemingly stand-alone episodes. You could say that anything about alien characters’ pasts is de facto mythological, but I’m here talking about factual hints or stories enhancing the season-long narrative. The first season built up Crais and introduced Scorpius. The second season developed the relationships and continued the characters’ individual journeys. You still need to have episodes accessible to new viewers, at first, but keep creating the launchpads for your bigger, upcoming stories. As much as we like to think we’re providing humanity with the greatest of cultural gifts, television is still, first and foremost, an entertainment medium. Science-fiction can be a super-serious drama, but it can (and should) be entertaining. Think back to Farscape‘s craziest, greatest hours of TV. Chances are it’s something you can’t imagine other sci-fi show to do. Hell, they even did a cartoon episode! Obviously, this may not be something you want to incorporate in your show, but playfulness should be. Crichton also offers countless opportunities to entertain the viewers. He’s an odd duck thrown into a world he has no understanding of. You don’t have to create an Abed-like character that drops references left and right. Making someone you can relate with, and also someone fun, can be achieved other ways. Don’t be dull. Be joyful. As Farscape viewers will remember, Scorpius tortures Crichton in “Nerve” (1×18). It’s shocking, disturbing, and, more importantly, impactful. The show doesn’t pull that kind of story for cheap thrills or just raise stakes. Long after the episode is over, the psychological toll is still present. Embedded forever into John Chrichton’s psyche. Instead of forgetting about it the next episode, the show used this pivotal episode as a fundamental shift in Crichton’s persona. From then on, he’s unhinged, borderline crazy. Our perception is completely changed, and so is he. In fact, this aspect of Crichton becomes a defining value of his character. No one forgets the “Crackers Don’t Matter” episode (2×04) which introduces us to the lovely Harvey (the Faux/Mind Scorpius in John’s head). This is a very different approach from all sci-fi shows that came before Farscape. Just take a look at Star Trek TNG‘s very own “Chain of Command, Part II“. Picard is physically and psychologically tortured by Cardassians. The next episode, it’s a whole tabula rasa. A reset. You can check an example of “Crazy Crichton” in this clip from “I Do, I Think” (2×12). You won’t see a Starfleet captain behaving like that (well…maybe Sisko). Psychological scars last as much as physical ones, if not longer. It’s much harder to “fix” the mind than a flesh wound. TV shows often forget that. You shouldn’t. Too many science-fiction shows reduce their characters, and alien races, into stereotypes. I’m a big fan of Star Trek, but the early series tended to summarize each race with a particular characteristic. Klingons = warrior, Vulcans = logical, Ferrengi = greedy. Yes, those traits became three-dimensional as the franchise progressed (especially through DS9). But you could still see them written across their foreheads. Going back to Farscape, you may summarize Rygel as “that puppet that farts helium”, but that is a huge disservice to the character. Even a few minutes into Farscape, you instantly know that he has more depth than other, actual human characters from other shows. Ka D’Argo wants his son, Jothee, back. John Crichton wants to go home. Aeryn Sun wants to know where she belongs. Rygel wants to become the Dominar he once was. And Zhaan wants to reunite with Eiffel 65. A show’s strength depends on the strength of the people. Even in a story-based world, you shouldn’t underestimate the importance of “real” characters over archetypes. This isn’t Moonlighting anymore. And such a thread has been done to, well, death. At this point, the horse getting beaten is merely the remnants of a disheveled carcass. Gross. The point here is, Farscape avoided that trap. Relationships are inherently dramatic. Sexual tensions are not (anymore). Crichton and Aeryn Sun “get together” pretty early on in the series. In fact, the show is usually at its best when they are together. It’s very hard to sustain any kind of tension between two leads, especially over several seasons. The audience wants to see some progression, and you can’t maintain a constant status quo. The two people are attracted to each other, and spend a ton of time together. There’s no real reason to keep them apart. One of Farscape‘s ballsiest move is, without a doubt, the cloning of John Crichton. As a refresher, Crichton in “Thanks For Sharing” (3×07) gets doubled. One stays on Moya with D’Argo, the other ends up on Talyn with Aeryn. The show ends up having its cake, and eating it too. In other words, it does both sides of the coin at the same time. One Crichton ends up with Aeryn, but then he dies. The lonely Crichton on Moya is reunited with his love, but she has grieved for her loss, and has moved on. It’s genuinely heart-wrenching. And it works. By killing one of the Crichton after he got together with Aeryn, you still have both a tragic “shipper” ending, and a stomach punch when she comes back, alone. You come back to a “will they, won’t they” plotline, but the reset makes it more powerful and interesting than ever. Farscape was one of the last great space-operas on TV. Science-fiction will always be a metaphor of the present by way of the future (at least mostly). Beyond that, it’s escapism. As much as I love Battlestar Galatica, the “grounded” and “serious” aspect of the series is completely different from the legitimately fun vibe of Farscape. 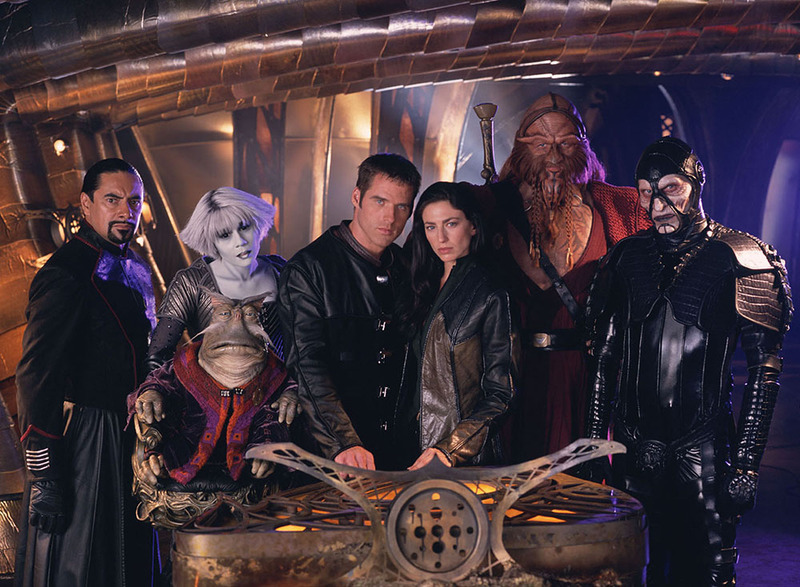 It is a trend right now that fiction needs to be “dark” and “gritty,” which does make Farscape the last successful sci-fi show of its kind (at least for now). Most of the BSG drama could be put on, say, a modern-day military ship, and it’d pretty much be the same plot. Tough luck doing that with Farscape. If you only glance at it, it’s “a bunch of puppets”. Yeah, and Buffy‘s vampires are “a bunch of guys in weird makeup”. The truth is, the show is more than that. It’s inventive, and it’s alien. A rare sight on TV nowadays. Why am I going on a mini-tirade over this? Because the show was at its peak when it embraced wholeheartedly its genre roots. There are tons of sci-fi tropes out there, but it doesn’t mean you can’t play with them. Farscape is genuine about the way it uses them. In “A Human Reaction” (1×16), Crichton seemingly returns to Earth through a wormhole. Unsurprisingly, it’s all an illusion (created by aliens). The illusion is destroyed when he tries to go to the ladies restroom (since he has no memories of ever being there in the real world). In a later episode, “Won’t Get Fooled Again” (2×15), the same scenario seems to be happening (or at least Crichton thinks it is). He doesn’t think twice about it, and goes straight to the ladies’ room to test the theory. Farscape understands that you probably have an encyclopedic knowledge of all things science-fiction, and it plays with your expectations. Aliens don’t speak English, so the show creates “translator microbes”. It embraced the genre it was in, and subverted it. Don’t tread water (or space). Farscape wasn’t afraid of big changes when they needed to be done. When it happened, it feelt earned. Characters don’t always emerge unscathed. And they die when it makes sense. Crais sacrifices himself and Talyn at the end of Season 3 because there is no other way out of this mess. The title of the double-parter is, in fact, “Into the Lion’s Den”. With a name like that, you can’t expect to get out the same way you got in. Earlier in that same season, the show’s usual format somewhat changed when the two Crichton separated. Even-numbered episodes are spent with the Talyn crew, and odd-numbered ones with the Moya people. The paradigm has shifted, which creates a more dynamic way of telling the “same old” stories. For all intents and purposes, the formula is relatively similar to what it’s always been. But it’s fresh. And the story has evolved. Another, greater example, is the middle of Season 4. The entire crew gets to Earth. For real. The show stops playing game with one of its most crucial plotlines, and the biggest one for Crichton’s evolution. It’s crazy to think that something so big, something most people take for granted as a “series-ender”, is in fact done midway through Season 4. You don’t need a major twist every episode (see Lesson 1), but you still need a continuous story with real stakes. Be audacious, and bodacious, with your story and your characters. Don’t be afraid to make bold moves that will have a resonance within your show, and with your viewers. Make an impact. And have fun while doing it.